Father’s Day is Sunday, June 16th! Surprise dad with a special gift to show you care! We have watches by Seiko, Citizen, Fossil and Pulsar. He will never be late for a meeting with one of these great pieces. We also have a huge selection of money clips, tie tacs and cuff links for those dads that like to look their best! If you have a hip and modern dad, he would love a piece from our stainless steel jewelry collection. These pieces are durable and last a lifetime. If are still unsure what to give your dad, we would be happy to suggest something for you! Stop by Jewelry Warehouse today and one of our jewelry experts can help you find that perfect gift for your dad! We are open from 10 – 7, Monday through Saturday. 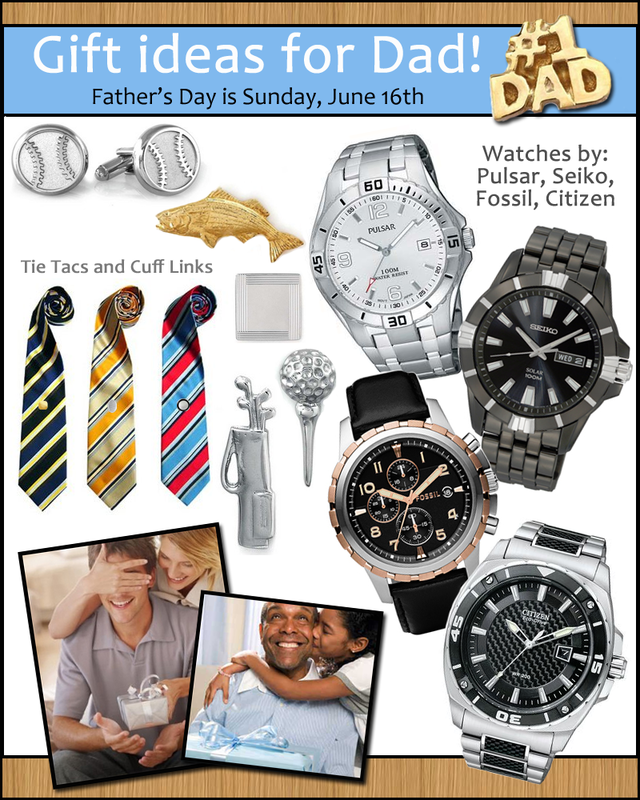 This entry was posted in Jewelry, Jewelry Brands, Jewelry Guides, Jewelry News, Jewelry Tips, Uncategorized, Watches and tagged citizen, father's day, father's day gift ideas, fossil, Jewelry, jewelry for dad, pulsar, seiko, watches. Bookmark the permalink.